1.FC BW Magdeburg is a hattrick football club based in New Mexico, USA that participates in VI.285. The club is owned by ro101. Magdeburg currently play their home games at Blau-Weiss-Arena. The team colors are blue and white. Since changing owners at the very beginning of season 28, 1.FC BW Magdeburg has quickly become one of the top teams in VI.285. Their best finish thus far came in season 34 when they became series champions for the first time in team history. They were unable to win their qualifier however and remain in division VI. During season 32, Magdeburg made its best showing in the US Open Cup by advancing to the third round. Michael Lujan (88789050) - Public Relations Manager. Inducted to 1.FC BW Magdeburg Hall of Fame 2008-01-07. 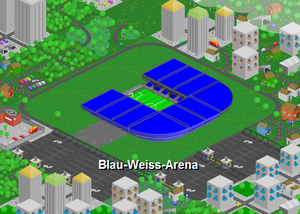 On 2008-01-15, the most recent upgrade to Blau-Weiss-Arena was completed increasing its total capacity to 28,000. This page was last edited on 24 May 2010, at 20:39.